Caroline Kathure. She is alleged to have sold her baby on October 18, 2018. Children are being sold like bananas at Pumwani Maternity Hospital, Nairobi, Kenya's biggest maternity facility. A group of brokers tout infants and haggle over prices as if the children are merchandise. Last evening, a 27-year-old woman was detained by police in Nairobi for attempting to sell a newborn to undercover journalists. The woman, Ms Caroline Kathure Gitonga, spent the night at Shauri Moyo Police Station after a joint investigation by the Daily Nation and NTV exposed her attempt to sell the baby, whom she claimed was hers, shortly after being discharged from the hospital. The investigation exposes a well-oiled and daring baby theft and smuggling syndicate operating within the corridors of the hospital. It was not clear whether the hospital staff are part of the syndicate, but the brokers claim to act on behalf of mothers and they operate freely within the hospital. In a dramatic probe that started from Nation Centre on Kimathi Street in the city and ended at Pumwani Hospital, Nation journalists who posed as buyers sealed the purchase for the eight-day-old baby for a meagre Sh50,000. The day of drama started with a mid-morning call to the undercover journalists indicating that a broker had identified a woman who was willing to sell her baby boy. Journalists rushed to the hospital, but Ms Gitonga said she was uncomfortable discussing the "deal" within the hospital, and so she had asked to be discharged. She had travelled from Meru to Nairobi to deliver the baby, who weighed 2.8 kilogrammes at birth. Our team waited for her to be discharged while at the same time alerting police officers and child welfare staff of the impending transaction. Outside the hospital, Ms Gitonga explained to the journalists that she wanted to sell her baby because she had financial problems. She has two other children, she explained. "Niko na shida, na sina wazazi (I have a lot of problems, and I am an orphan," she said. 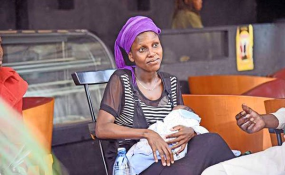 Ms Gitonga initially asked for Sh70,000 for the baby, but after a short session of bargaining, held at a restaurant near the hospital, agreed to Sh50,000. She had her name tag and hospital documents to show that the baby was hers, but she had not named the little bundle of joy she cradled in her arms. Reporters kept Ms Gitonga engaged after reaching the sale agreement, convincing her to wait a little longer for the money since the full amount was not available immediately, and that someone was bringing the balance. Unknown to her, reporters were waiting for child welfare officers to come and rescue the baby. Ms Gitonga was arrested and her baby taken into the custody of the emergency rescue and rapid response officers as police investigate whether the baby is, indeed, hers. Pumwani Maternity Hospital has been accused of letting a baby theft syndicate thrive within its wards, with newborns taken from their mothers' arms and sold to buyers who are either desperate to have children, or are part of a wider child smuggling network. One of the factors aiding this theft is poor patient documentation, identified in an investigation by the Kenya Medical Practitioners and Dentists' Board (KMPDDB). The hospital has in recent days been in the limelight for all the wrong reasons, including lack of a mortuary and use of ambulances, rather than hearses, to ferry bodies. In 2015, a couple expecting a twin bundle of joy walked into the hospital, only to be told a few hours later that their newborn baby boys had died in what they considered controversial circumstances. In its defence, the hospital's chief executive officer said the babies were stillborn. Just last month, a woman was arrested for stealing a baby from the maternity facility and using a backpack to smuggle him from the facility.